Discover Tenerife with all your senses! Discover your senses and feel, taste, smell and hear the beautiful nature surrounding us on our easy one-hour hike on the „Path of the Senses“ in the Magical Forests of Las Mercedes. After that we will visit the Museum of Anaga where we can learn a lot more about the region itself. During a visit of the Farmer‘s Market in La Laguna you can enjoy the colours and freshness of the products and armed with a shopping list we will buy also all ingredients for a typical Mojo-Sauce. We will learn how to make it at the Bodega Álvaro - an old and very classy winery and after-wards enjoy it together with tapas and wine. Discover the three most important volcanoes of Tenerife and find out more about the islands origins! This tour is a perfect adventure for the whole family. Our tour leads us first to the Chinyero – Tenerife‘s youngest volcano. Here we enjoy an easy hike of about 1,5-2 h across black lava fields seamed with green pine trees. We carry on until we reach the oldest volcano - the Pico Viejo. 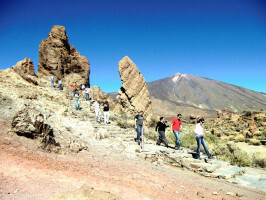 Soon after we arrive at the bizarre rock formations of “Roques de Garcia” and experience a breathtaking view on the highest mountain in whole Spain - the Pico del Teide. The tour continues on to the Finca Ecologico Alma de Trevejos, where we can enjoy a tasty and rustically BBQ, some wines of the region (or soft drinks). Enjoy a small walk over the Finca, see the different farm animals – most of the endemic species from the Canary Islands, discover the vast amount of different fruit trees and simply enjoy the stunning views over the whole area. To round up the day we will also plant a small seedling. With this gesture will honor the nature experienced today and give a little bit back to ensure that also following generation can enjoy the same as we had today. Printed voucher or E-voucher. Print and bring the voucher or show the voucher on your mobile device to enjoy the activity.. Please contact supplier at least 24 hours prior to tour to arrange pick up. Duration : 8 hours approx. guide/instructors speak: Spanish, German , English . *Should an emergency arise, please call at the next telephone number: +34 971 211601 - 24 hours (Languages spoken: Spanish, English-.